Thierry Mugler's rise to fame began at the age of 20. This is when Mugler moved to Paris and his unique style earned him many admirers. He soon began designing clothing for niche Parisian boutique Gudule, famed for its promotion of little known designers. At 22, he had moved on to work for many different ready-to-wear fashion houses in Paris, Milan, London and Barcelona, and eventually created his own collection named 'Cafe de Paris'. This collection was a huge departure from the fashion of the time; instead of the bohemian, flowing fabrics and laid-back styles prevalent both in the streets and on the catwalk, Mugler created an impression of hyper-femininity, of structure, graphic cuts and a highly stylised silhouette. This design style would go on to become Mugler's trademark, easily identifiable because of its modernity. His reinvention of the female silhouette would earn Mugler the moniker of "provocative designer" by the fashion pack, experimenting with different materials and resculpting the notion of female seduction to emphasise elegance and harmony. Mugler's fashion shows are indicative of his theatrical past, and he assumes the role of both creative artist and show director in order to transpose his vivid imaginings onto the centre stage. Such shows are a display of the extraordinary, working every possible medium - lights, fashion, music and art - in order to create a liturgical, divine and mystical aesthetic. The Mugler fragrances A*Men, Angel and Alien are truly iconic. 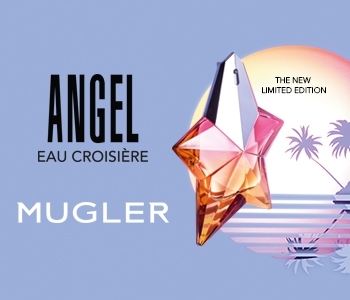 Designed with little thought to current trends, Mugler's scents are true to his unique vision, and come complete with their own phantasmagorical universes. In the tradition of perfume fountains of old, Mugler's key fragrances can be refilled from a source, which encourages fans to keep and reuse the same bottle.